coat of arms with supporters for use in Philippines, China, France, Germany, Italy, Russia, and Spain. Registered in The Chinese Armorial, July 27, 2013. 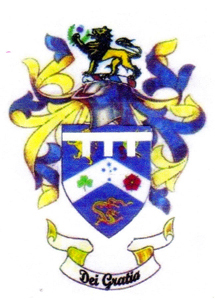 Arms: Azure, on a chevron Argent between in chief dexter a lion rampant double-queued Or and sinister an eagle rising wings elevated and addorsed Or armed Gules holding in its dexter talon a sheaf of arrows points downwards Proper and in base a Chinese dragon Or langued Gules horned and whiskered Argent, the constellation Southern Cross (Crux Australis) as four main stars each of seven points and the smaller star of five points Azure between dexter a shamrock Vert and sinister a rose Gules barbed Vert seeded Or. Crest: From a wreath of Argent, Azure and Gules, a lion passant, double-queued and armed Gules, holding in its dexter paw a thistle Proper. Supporters: Dexter a kangaroo Proper, gorget of a collar charged with a Chinese dragon, attached thereto a chain reflexed over the back and ending in a ring, all Or, sinister, a stag Proper, gorget of a collar charged with a Chinese dragon, attached thereto a chain reflexed over the back and ending in a ring , all Or, both standing on a compartment Vert embellished with Australian wildflowers Proper. Badge (as at October 29, 2015): A Chinese dragon Or inside a closed belt Sable, edged, buckled and charged with the motto of the arms Or. Standard: In the hoist Argent, five mullets Azure in the form of the Constellation Southern Cross (Crux Australis) with the four main stars each of seven points and the smaller star of five points and in the fly tierced per fess Or and Azure in three compartments separated by two bends Sable inscribed with the motto Dei Gratia in letters Or. Private Registration: Arms: United States Heraldic Registry, Registration Number 20100321R, March 21, 2010. 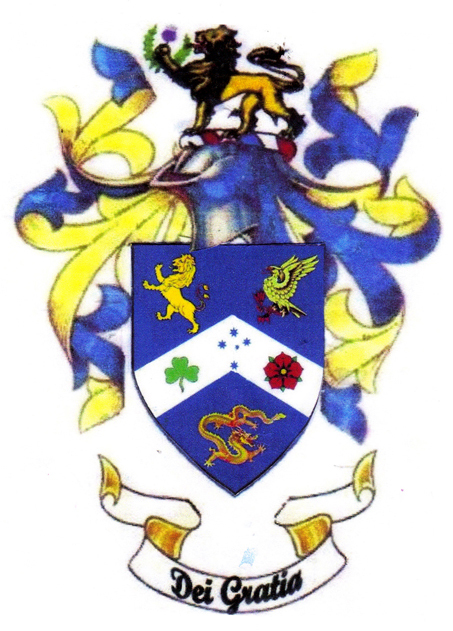 The armiger designed his own coat of arms and that of his nephew, Christopher David Kelly. The armiger is of English, Irish, and Scottish ancestry and does not have Chinese ancestry, but his wife has Filipino and Chinese ancestry, and hence, so do their son Andrew Edward C. Kelly and grandson Riley James Kelly. 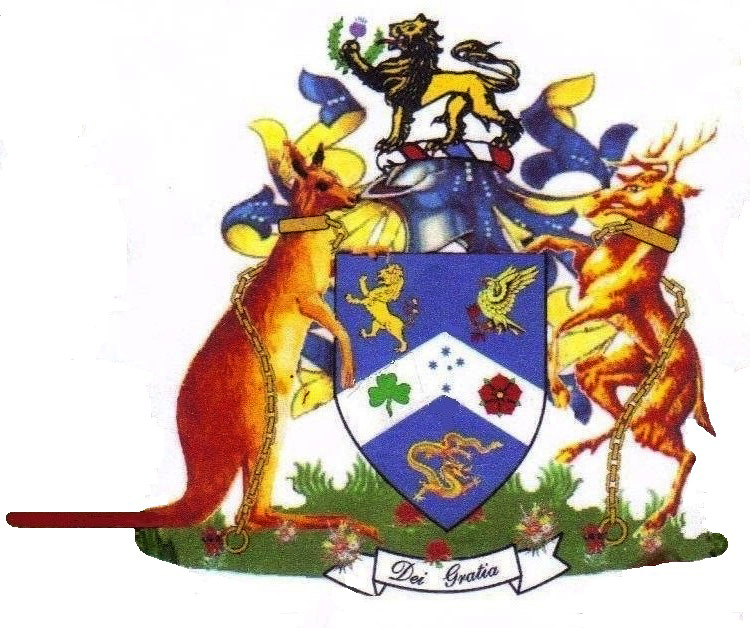 Francis's coat of arms has symbols of the British, Filipino, and Chinese origins of their family, and Andrew and Riley use Francis's coat of arms differenced with marks of cadency. 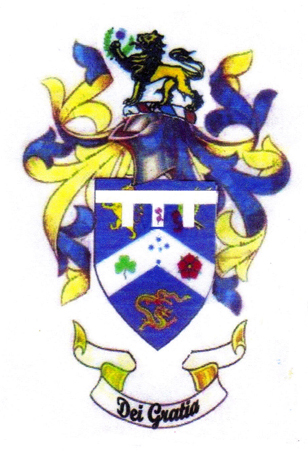 The armiger's ancestral coat of arms shows two rampant lions Argent and a rampant lion Gules. For his own arms, he used a rampant lion but changed its colour to Or double-queued on an Azure field. His wife's ancestry is represented by the eagle Or for the Philippines, the arrows Proper for Spain, and the Chinese dragon for China. Mr. Kelly's ancestry is represented by the rose Gules for England, the shamrock Vert for Ireland, and the thistle Proper for Scotland. Both families migrated to Australia, which is symbolized by the Southern Cross. The dexter supporter, the kangaroo, is another symbol of Australia. The badge had a black dragon (dragon Sable) from 2013 to 2015. 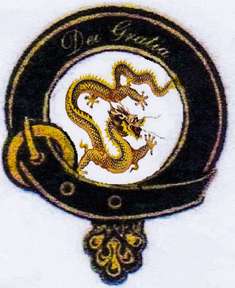 Mr. Kelly revised the badge to have a gold dragon (dragon Or) on October 29, 2015.